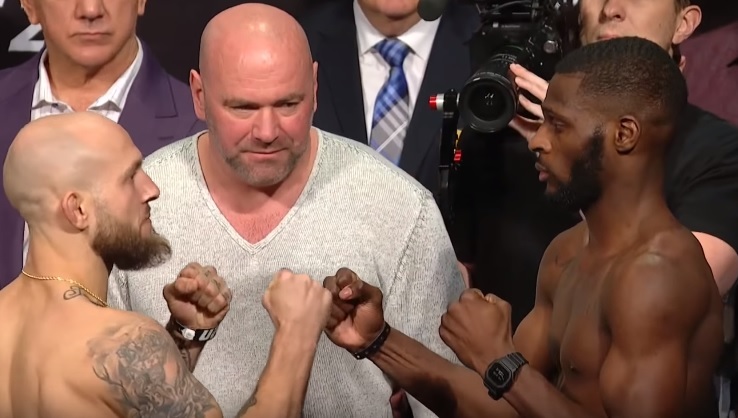 Brian “Boom” Kelleher of Selden, New York, United States and Montel “Quik” Jackson of Milwaukee, Wisconsin, United States were two of the mixed martial artists who competed at “UFC 232.” It was the final event of the Ultimate Fighting Championship for 2018. Featuring 13 MMA bouts, “UFC 232” took place at The Forum, Inglewood, California, United States on December 29, 2018. Kelleher faced Jackson in the first bout of the evening. Born on April 24, 1992, Jackson has been competing professionally since 2017. He is training out of Pura Vida BJJ/MMA in Milwaukee. “UFC 232” marked Jackson’s second UFC bout. When he made his promotional debut at “UFC 227” on August 4, 2018, he lost via unanimous decision to Ricky Simon of Vancouver, Washington, United States. Kelleher was born in Oceanside, New York on August 19, 1986. He is training out of Long Island MMA in Farmingdale, New York. Competing professionally since 2011, Kelleher made his UFC debut at “UFC 212” on June 3, 2017 and submitted Iuri “Marajo” Alcantara of Soure, Para, Brazil via guillotine choke. Kelleher and Jackson competed at a catch weight of 137 lbs. Referee Edward Collantes put a stop to the contest at 1:40 of the first round when the fighter from Wisconsin submitted his opponent from New York via D’Arce choke. Winning at “UFC 232” improved Jackson’s professional MMA record to 7 wins and 1 loss. On the other hand, Kelleher now has 19 wins and 10 losses.